These post-baccalaureate degree programs are designed for individuals who have earned a bachelor's degree at an accredited institution and want to pursue another undergraduate degree. With an additional 45 credits, a student can earn a second bachelor's degree. (Download the checksheets below for required courses). Up to five classes (15 credits) taken for the previous degree may be applied to this degree (if the courses meet the degree requirements). 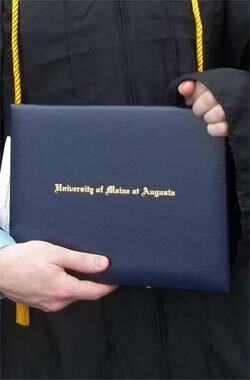 Thirty credits (10 classes) must be taken through UMA to meet the residency requirements for the degree. For the Post-Bacc in CIS, no previous computer courses are required. The goal of the program is to provide a Computer Information Systems degree that meets the requirements of businesses seeking information technology professionals. Based on the national contemporary information systems curriculum (IS '2002/IS2010'), the UMA curriculum provides a core of computer science and discrete mathematics, hardware and operating systems, networking, management information systems, information systems modeling, database design, applications development, Web design and development, management of information technology, and the impact of computing. In addition to a consistent core among the associate, bachelor, and post-baccalaureate degrees, students may concentrate in a specific technology area, such as programming, data science, networking, information systems security, or Web design and development. The object-oriented paradigm and networked applications are emphasized across the curriculum, as are listening skills, oral and written communications, and teamwork. The CIS program recognizes the value of relevant work experience and partners with technology-based organizations to provide internship experiences to provide students with an opportunity to broaden their skills base in information technology, cultivate mature life and workplace skills that prepare the student for personal and professional challenges, and establish a network of professional contacts in the information technology field. The emerging field of Cybersecurity is based on an evolving discipline that involves the study of strategy, policy, and standards regarding the security of and operations in cyberspace. Topics include threat reduction, vulnerability reduction, deterrence, international engagement, incident response, resiliency, and recovery policies and activities, including computer network operations, information assurance, law enforcement, diplomacy, military, and intelligence missions as they relate to the security and stability of the global information and communications infrastructure (National Initiative for Cybersecurity Careers and Studies). The Bachelor of Science in Cybersecurity program will prepare you for career opportunities or advanced education in the Cybersecurity field including positions in security analysis, information assurance, digital forensics, intelligence, and cyber defense to name a few. With billions of dollars in global losses due to cybersecurity exploits, the need for trained experts is growing at an astonishing rate. The U.S. Bureau of Labor Statistics is predicting 37% growth in employment in the cybersecurity field by 2020. Graduates with a B.S. in Cybersecurity will be prepared to fill these new positions as well as a predicted gap in Maine's IT workforce significantly improving the statewide prospect for excellence in the computer-based delivery of information security services. Available through a partnership between UMA, UMFK, UMaine, and USM, the Bachelor of Science in Cybersecurity incorporates a multidisciplinary perspective through a combination of courses that offer a holistic approach to cybersecurity education by providing the opportunity to take courses not only in computer science and technology but also in the humanities, social sciences and ethics (e.g. Crisis Communication, Human Communication Skills, Philosophy of Social Media, and Security). The curriculum has been designed to meet the stringent academic standards of the NSA/DHS jointly sponsored Center of Academic Excellence in Information Assurance/Cyber Defense (CAEIA/CD) program. The B.S. in Cybersecurity is the first ever system collaborated degree program to be recognized by the CAEIA/CD. This NSA/DHS recognition program serves as the de facto accreditation standard for Cybersecurity. Required courses can be taken completely online, or through a combination of live, online and ITV classes. Students can enroll now in the Bachelor of Science in Cybersecurity and classes will begin in the fall 2015 semester. Contact UMA Enrollment Services at 1-877-UMA-1234.